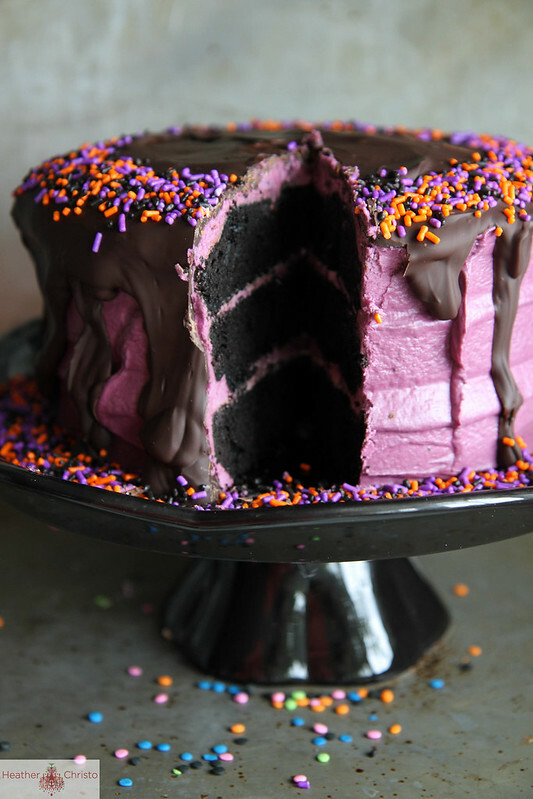 For any of you gouhls and goblins that are looking for a spooky Halloween treat to celebrate this week, how about giving this Black Velvet Cake a whirl? 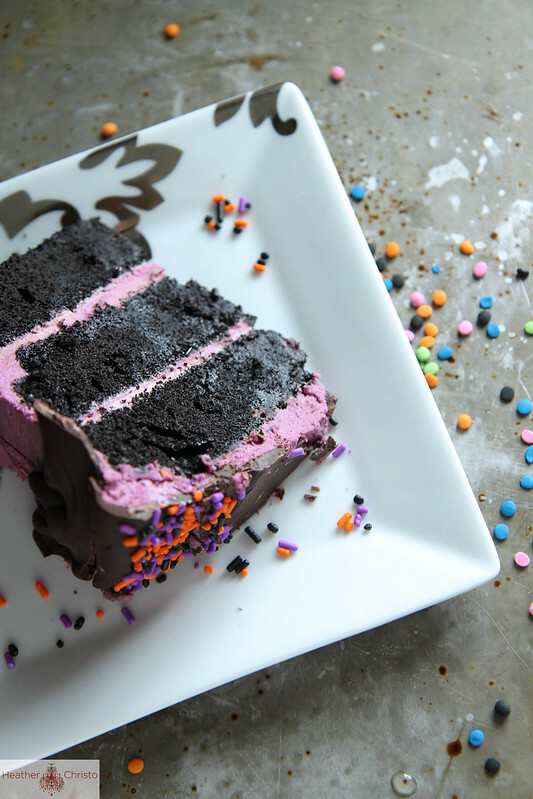 This cake is completely inspired by Halloween, and the rich chocolaty cake layers are indeed reminiscent of black velvet! The thought if 2 bottles of black food coloring really grossed me out, so I just laced a very dark chocolate cake with a little black food coloring, and it totally got the job done. 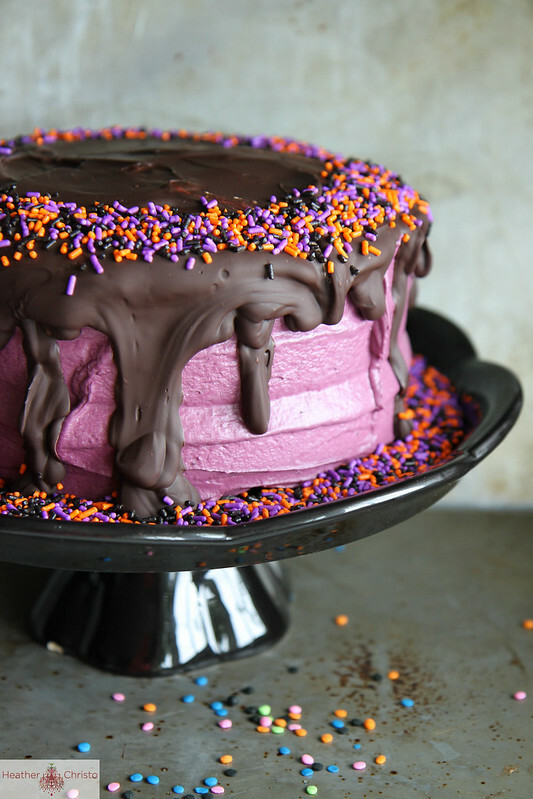 I thought that the pinkish purple hued frosting was a really fun and beautiful contrast to the color of the cake. The chocolate crown and the fun sprinkles were the icing on the cake (pun intended) and made the cake totally worthy of a celebration! Let me know, what are you dressing up as for Halloween? Oh and also, 5 more days till we get our puppy. I am dying over it!! Preheat the oven to 350 degrees. Prepare three 8” pans with cooking spray and parchment rounds. For the Cake: Put the cocoa powder in a small bowl, and pour the boiling water on top of it.Whisk the water and cocoa together until smooth, and then set aside until cooled. In a mixing bowl or standing mixer, beat the butter and sugar together until pale and fluffy. Add the vanilla and the eggs one at a time until they completely combined. Sift all of the dry ingredients together. 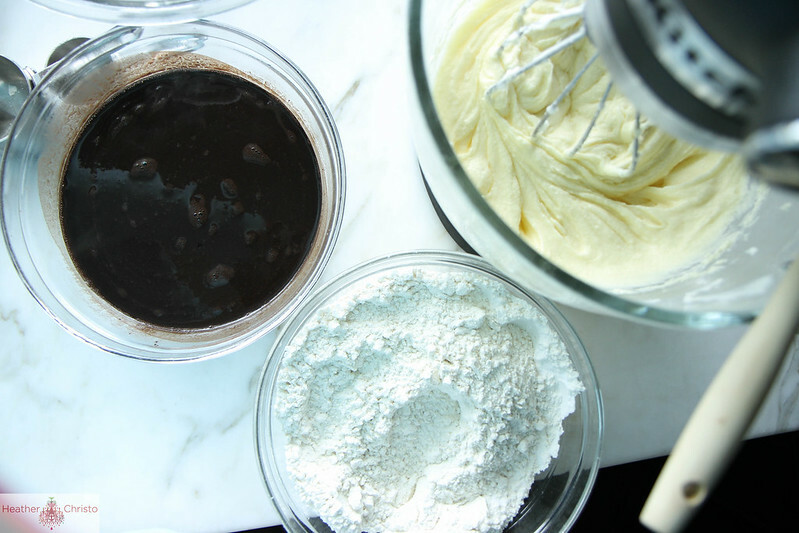 Gently add half of the dry ingredients to the batter and half of the chocolate. Mix to combine. Repeat with the remaining ingredients and mix into a smooth batter. Add the black food coloring and mix completely in. 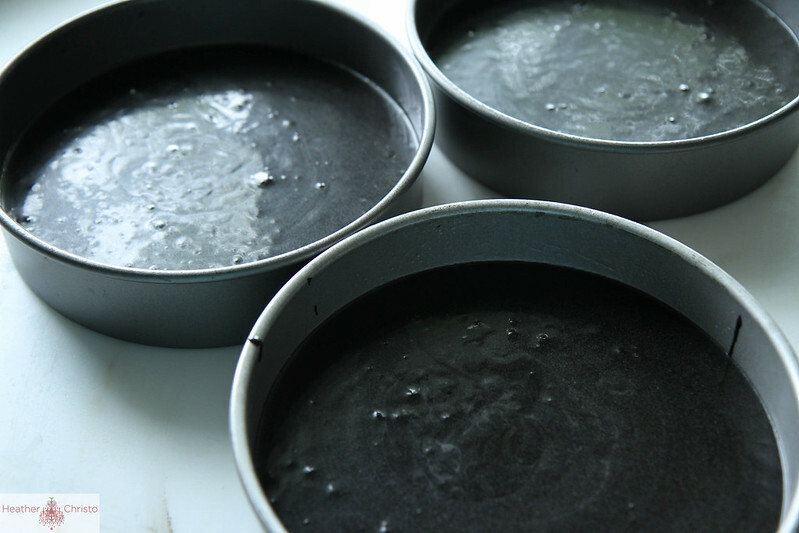 Divide the batter evenly between the three pans. Let the cake layers cool completely before frosting them. In the bowl of a standing mixer, combine the soft butter, powdered sugar and milk and whip until fluffy. Add the vanilla and the food coloring and combine well. Spread ¼ of the frosting in between each of the cake layers and save the other half of the frosting for the outside of the cake. When it is completely frosted, I recommend refrigerating it for about 30 minutes before adding the chocolate. Pour the melted chocolate over the top of the cake and let is drip down the edges. Apply sprinkles immediately to wet chocolate. Put the cocoa powder in a small bowl, and pour the boiling water on top of it. Whisk the water and cocoa together until smooth, and then set aside until cooled. In a mixing bowl or standing mixer, beat the butter and sugar together until pale and fluffy. Add the vanilla and the eggs one at a time until they completely combined. Gently add half of the dry ingredients to the batter and half of the chocolate. Mix to combine. Repeat with the remaining ingredients and mix into a smooth batter. Add the black food coloring and mix completely in. OMG Heather! Best Cleopatra ever! I’m loving the purple-ly pink color for Halloween this year. Over the weekend I drove past a big old Gothic mansion in Saratoga Springs,NY that had a porch decorated for Halloween in pinky- purple and black. It was soooo chic. You have hit upon something here with your cake and glitter horse head. Thanks Kelley! I was super into those colors this year- they are all over our decorations- I like how they make the typical spooky black stuff tre chic! This is super fab. I love how dark and dreamy the layers are! You have got to be one of the best Cleopatra’s out there! You look awesome and so does this cake! I would choose it over red velvet any day! OMG Teighan- thanks for the Cleopatra vote of confidence! 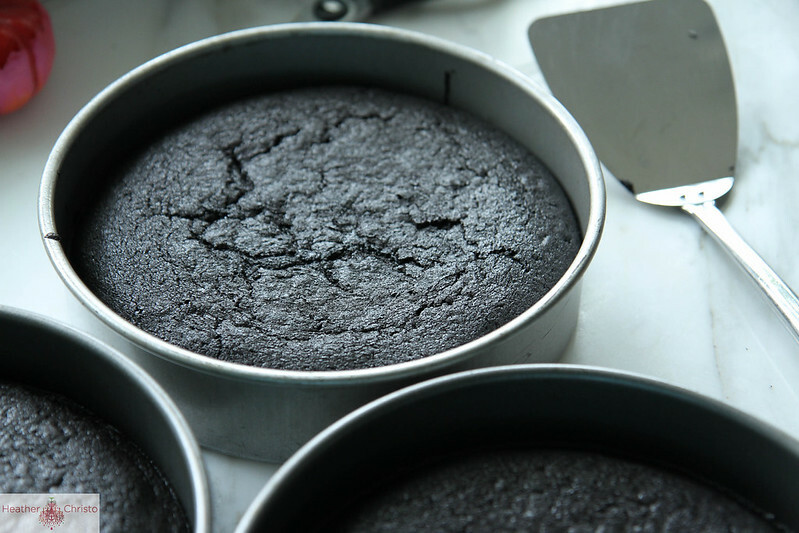 Love the idea of using a chocolate cake as a base! Gorgeous! 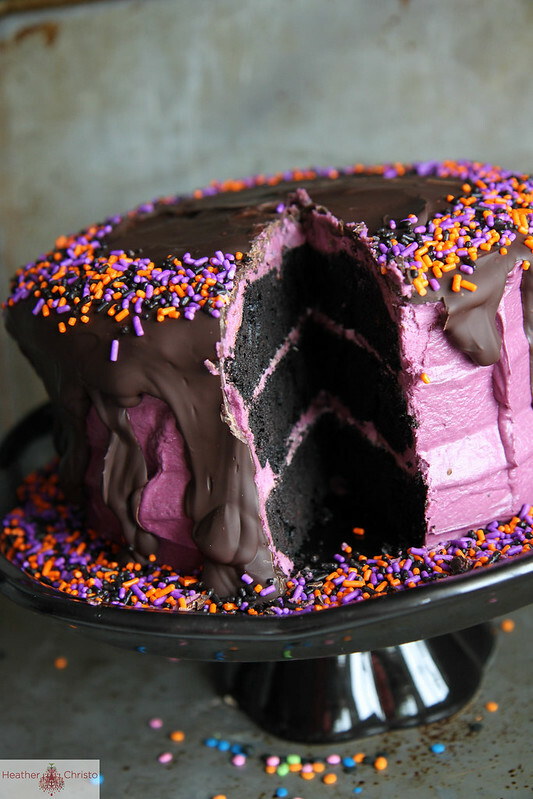 Such a great cake… I am with you on the food coloring! 🙂 I LOVE your costume!!! Its perfect! Cant wait to meet your puppy too! Thank you so much Amanda. obsessed with incoming puppy! Wow, what a fun cake! this cake is stunning! i love the dark dark chocolate!! YOU, my friend, look just like Cleopatra!! Gorgeous get-up!! You did such a wonderful job!!! Can’t wait to see pics of the new puppy!!! This cake is beyond gorgeous, Heather!! Truly stunning!! Wow, this is just stunning!! Love the colors!! That deep cocoa color is just stunning! You look stunning as Cleopatra! And this cake!!! So perfectly halloween appropriate. How do you get the sprinkles to look like that on top (around the edge only)? Super easy Kristen- you seriously just sprinkle them on the edge of the top. The melted chocolate helps them stick immediately. OMG- you are such a gorgeous a Cleopatra. And that cake – to die for! This cake is stunning!!! It’s like something out of a wild sugar-overdose dream! Also, you look gorgeous as Cleopatra! Fab costume! Love the cake. Wow! Look at that cake! LOVE your costume and OHHHH what a gorgeous cake!! Eeep! Love that cake and love your costume – you’re gorgeous! O.M.G. I want to come celebrate halloween Heather Cristo style! And please please please ship me that cake. Please. The cake is beautiful!! But just one question, what color do you use to make the icing? I’m stumped if you are using the black coloring to make it that color? Please let me know…. Hi Melinda- that was a mixture of blue and red (to make violet) food coloring. The black is in the cake part itself. 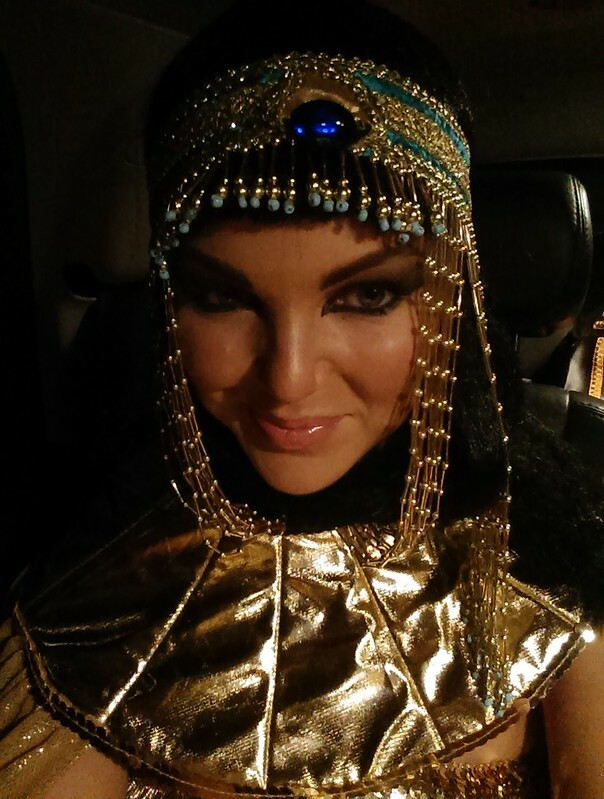 Love the cake & your costume; what brand of self tanner did you use to get that dark Cleopatra look? St Tropez extra dark lee! I am definitely going to try this cake. It looks devine> don”t how many kilos as well !!!!!! 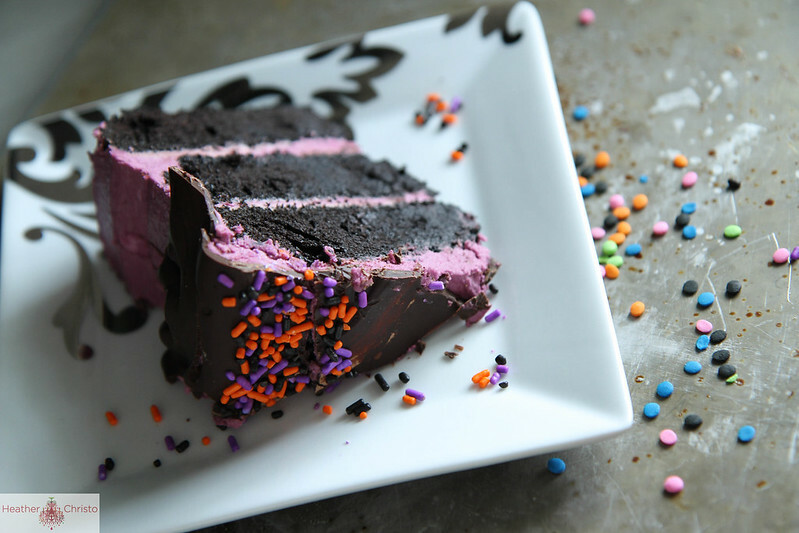 Pingback: 35 Halloween Cakes, Cookies And Cupcakes To Try And Make On Your Own! Pingback: Halloween Cakes, Cookies And Cupcakes To Try And Make On Your Own! Pingback: Easy Halloween Cake Recipes for Kids - Perfect for Parties! Looks Awesome thank yo for sharing. I want to make this into cupcakes. Will I need to change the recipe any. I am going to make a white chocolate buttercream and the the bloody axes and sugar blood spray for decoration. Can’t wait to see how they turn out! Nope! recipes should be just fine as cupcakes! Sounds really cute!! Hi! I’m going to make this for Halloween next week. How did you get that colour for the frosting? Thank you! Hi Marina! !I just used food coloring- it was more red than blue. Your cake looks amazing going to give it a try. This is such a beautiful looking cake. I am sure it tastes great too. Would you by any chance have an eggless recipe for this cake? This is such a beautiful looking cake. Would you have an eggless recipe too for this cake? Hi, looks great! Question: there is a strange typo over the amount of the baking soda: . What is the exact amount? Thanks! Hey Megan! I wonder if its your browser? it is 2 teaspoons of baking soda. How do you think this would hold up if I made it the night before for a party the following night (aka Friday night for Saturday night)? I have to work all day Saturday so I’d have to bake in advance. Thanks so much! This looks amazing! Hi Marisa- it would be just fine- I would just keep it under a cake dome if I were you!